I finally had a chance to read The Strange Case of Origami Yoda, by Tom Angleberger, over the weekend, and, after finishing it, I spent the rest of the weekend obsessively folding multiple origami Yodas, from simple to complex. This book is indeed “reluctant reader platinum,” as one reviewer raved, but I have to admit that I (a discerning and book-loving adult) found the book awesome too. How often do children’s books have colophons??? From the sturdy construction and doodled cartoons to the well chosen typefaces and various crumpled, torn, and dog-eared paper effects for each page (which become origami crease patterns on the pages with directions for folding your own Origami Yoda), this is a beautifully designed book. It’s the story of geeky Dwight—math whiz, free spirit, total loser, and origami master—who carries Origami Yoda, a finger puppet, around on his finger. Origami Yoda knows things that Dwight couldn’t possibly know. He sees the future, solves problems, and offers advice with the wisdom of a Jedi master. Or does he? 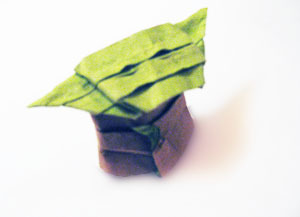 Is Origami Yoda real? That’s the burning question that causes Tommy to start collecting a case file on Origami Yoda. He needs scientific evidence, because he needs to know if he should risk making a fool of himself for the cool girl he really likes. I myself started to have utter faith in the verity of Origami Yoda by the end of the second chapter, “Origami Yoda and the Embarrassing Stain.” Kellen, creator of the doodles that appear through the case file, gets an embarrassing stain on his pants (never mind how). The warning bell rings, and he has one minute to get to class. He can’t afford to be late again, and he can’t face the ridicule that will be his (not to mention total disdain from every girl!). 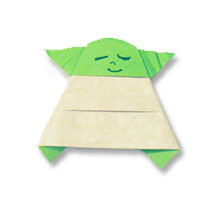 But Origami Yoda saves the day! If you love origami and Star Wars with a passion that is pure and true, you will love this book. If you are a person who has ever gone to middle school, or who might have to go to middle school some day, you will love this book. If you are a person who likes to laugh, you will love this book. If you want to learn how to fold Origami Yoda, Tom Angleberger will show you how in this video! To see something really cool, click the image below. I was taking some time off in August to spend time with visiting friends and family, so I’m just now posting photos from last month’s Origami Cool Zone at the Juan Tabo Library. We made crabs and seashells, saying goodbye to the summer and to “Make a Splash @ Your Library” with more origami sea life. I loved taking photos of people’s hands as they folded. We also said goodbye to the Juan Tabo Library, because the Origami Cool Zone is moving with me to the Tony Hillerman Library! Vicky (a.k.a. “Ms. V”) moves up! Hi everybody, Page here! Great news! Vicky has just started a new job as Youth Services Librarian at the Tony Hillerman Library here in Albuquerque. It’s a branch of the Albuquerque/Bernalillo County Library System, and it’s very close to the Juan Tabo Library where she has worked for the past year. She is excited about it because she will get to learn a lot, and she’s happiest when she is in a place where she can learn a lot and also try out a lot of new ideas. I suspect that is why she has always worked in libraries, which are quite good for learning and for ideas. She will also still be working with her musical partner, Linda Kennedy, who is now the branch manager at the Hillerman Library. I am on vacation for the whole month of August, yippeeee! It’s actually a mission to help Ms. V by collecting a lot more stories for our Page Presents show. Being a Bookworm, collecting stories is my meat and potatoes…mmmm, mmmmm, GOOOOOOOOooooooood! Check out the nice poster she made to tell everybody at the new library about Page Presents, which will start at the Hillerman Library in September! For my last “Make a Splash” storytime of the Summer Reading Program, I chose the book, Shark and Lobster’s Amazing Undersea Adventure, by Viviane Schwarz. I’m indebted to my colleague, Heather Watson, who offered her Bruce the Shark puppet for me to use, because I would not have discovered this great book if I had not been casting about for a good shark story. Our library system did not have it, and I ended up buying my own copy based on the rave reviews I found online. We had a number of plastic lobsters that were part of our summer decor at the library, so I snagged one for my puppet show and I made the other puppets I needed for the story. A story about fear, fun, stripes, and TEETH. Shark is scared. Someone has told him about a thing that’s full of teeth and stripes…TIGERS! So he and Lobster and a number of eager helpers decide to build a fortress so they will be safe from tigers. This book is deliciously silly, and the text and illustrations complement each other perfectly. The fortress eventually includes a piano (in my version, it was a marimba—because I just like saying that word and because my wooden tongue drum sounds a bit like a marimba and would fit on the puppet stage). Shark even sings an operatic aria about the dangers of tigers, which I performed with gusto. I seem to have lost all fear of looking like an idiot. Unfortunately, Shark’s aria reawakens everyone’s fear of tigers, and they decide that they need “a truly frightful thing” to protect them. They carry up a sleeping sea monster and tie it in a knot around their fortress and are singing and dancing and playing the marimba to celebrate. Naturally this awakens the sea monster, who chases everyone all around until it finally gets tired and goes home. After surviving the sea monster attack, the imagined tigers seem less fearsome. As Shark points out to his friend, Lobster, “I’M full of teeth, and YOU’RE full of stripes! This was true. So from then on, they weren’t afraid of anything. I had fun making a sea monster puppet out of an old towel, a plastic bottle, and various odds and ends. Our page, Andrew, joined Mr. Matt again, and they passed out rhythm instruments to the kids and taught them two different simple rhythms to play against a calypso rhythm. After the story, Matt and I held the limbo pole, and the kids could hardly wait to circle around and writhe under the ever-lowering pole. I hope someone sends me some photos! I don’t think I’ve ever seen such huge grins of delight on every single kid’s face! Note to self: find more stories from the West Indies. Matt and Andrew continued drumming together as the kids worked on their sea monster masks. These seemed to spark everyone’s dramatic imagination. I did not made an example for them this time because I wanted to leave this craft completely up to each child’s personal vision. Each child got a mask template and a lot of assorted eyeballs and body parts (from Sarah McIntyre, illustrator of Morris the Mankiest Monster by Giles Andreae). I also set out several boxes of assorted random materials. The sea monster masks seemed to inspire a lot of dramatic play. Who would want to encounter this frightful crew? Ravi had been working hard on his mask and didn’t want me to photograph it until he had completed it to his satisfaction. Finally he rushed over to show me. “I’m a sea DRAGON,” he informed me. This story makes me happy. The song that the Shark sings has hilarious melodramatic and portentous chords. Linda Kennedy and I pulled off our free concert to end the Summer Reading Program (Make a Splash @ Your Library) in grand style last Tuesday. Our program included several really fun arrangements by Kathryn Cater and Sandy Duffy Norman of the harp/flute duo, Rosewynde. All are from their 2006 recording, Walking Tune, including “Banks of Sullane/Paiste Fionn,” “Drowsy Maggie Medley,” and “The Ash Grove.” Listen to the entire track of “Banks of Sullane” and you’ll know why we enjoyed playing this music so much. We always tell stories as part of the concert. I told a selkie story, “The Seal-woman’s Sea-Joy” (from the second volume of Songs of the Hebrides, by the Rev. Kenneth Macleod and Margery Kennedy-Fraser), as well as a true story about Hyak, a captive wild book-loving orca who once lived at the Vancouver Aquarium (by Kelly Balcomb-Bartok in Whale Tales, collected by Peter J. Fromm). I hope someone sends me photos of Stuart wearing the huge Orca costume. He played his part perfectly. I will definitely post photos if they come to me. For our final story, we did a reader’s theater version of “The Man Whose Mother Was a Pirate,” by Margaret Mahy (in A Treasury of Pirate Stories). Our colleague, Brandi Anton, played the pirate mother, and Linda played the little man in the brown suit. I narrated and played the parts of the little man’s boss, Mr. Fat; the farmer; the philosopher; and the sea captain. Brandi has a great deal of experience as a pirate (one of her Society for Creative Anachronism alter egos), and she was fabulous. She and Linda are great co-conspirators in committing random acts of whimsy. I had a concert this week, so I was too busy preparing for that to post about last week’s Page Presents class. Our story was Greyling, by Jane Yolen (one of my favorite authors and storytellers) and illustrated by David Ray. I threw Mr. Matt a curveball, since he came prepared for calypso music, limbo, and Shark and Lobster’s Amazing Undersea Adventure (which I had decided at the last minute to save for the following week!). With his signature grace and good humor, he easily adjusted to the slow 6/8 bagpipe coronach by the Whistlebinkies and had the kids stepping on beats 1 and 4 and clapping on beats 2,3 and 5,6. Then he and I placed the limbo pole on the floor between us and the kids took turns leaping over it a la Highland sword dancing. Told with lyric simplicity, Greyling is the story of a fisherman and his wife who live by the sea, which brings them everything they could ever want or need…except a child. Eventually it does bring them a selkie, a seal pup that they rescue only to discover that it has become a human child on land. I got a wonderful new seal puppet (actually a sea lion), which seems so lifelike that it startles us whenever we walk into a room and see it gazing back at us. I realized that it would be a challenge to pull off a little bit of stage magic when the seal transforms into a human baby. I decided to tell the story from the wife’s point of view, and, in my version of the story, it’s the wife who discovers the seal pup abandoned on the beach while she is out gathering seaweed. “Then he shall never go back to the sea,” his wife declares. And the child, whom they name Greyling for his grey eyes and hair, grows up helping his father to repair his boat and mend his nets, but he is never allowed to go near the sea. I accomplished the transformation by having the baby doll wrapped in a brown knit wrap that doubled as a sandbar where the seal pup is stranded. When I stooped to wrap the pup in my shawl, I picked up the entire bundle, which I was able to shift as I cradled it in my arms so that, when I opened the shawl to show the audience the seal, the baby’s face peeked out instead. There was an audible gasp, so it was quite a nice bit of magic! After the story, we made selkie masks. Beckham’s fabulous tribal-looking one made me think of the Great Selkie, who often takes a human bride.